How to modify your DISTRICT OF COLUMBIA custody and visitation plan by yourself; includes the legal forms that you need. 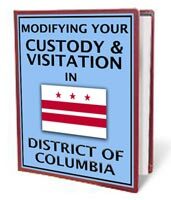 You will have access, at our Download Site, to the legal forms you need to modify custody-visitation in Washington D.C. These forms are the most current versions available.